Myasthenia gravis (MG) is an autoimmune disorder. The signal from the nerves to the muscles is blocked. As a result, the muscle cannot move and become increasingly weaker. Symptoms may grow more severe over time. This is a potentially serious condition. MG requires care from your doctor. If you suspect you have this condition, contact your doctor immediately. The root cause of MG is unknown. It occurs when the body’s immune system attacks receptors in muscle. Normally, these receptors respond to the chemical acetylcholine (ACh). This chemical allows nerve signals to prompt the muscles to move. When the immune system prevents these receptors from working well, the muscles cannot respond to nerve signals. 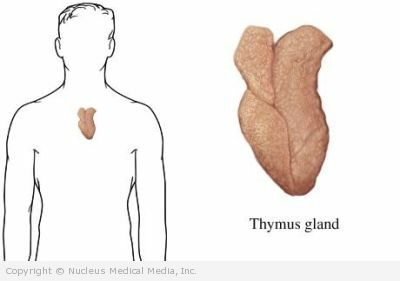 The thymus is thought to play a role in some cases of MG. The thymus is an organ behind the breastbone. Immune proteins called antibodies are produced there. It is these antibodies that may target the ACh receptors. It is still not clear why the thymus begins to produce these. Infants of mothers with MG are more likely to develop a temporary form. It is called neonatal MG. The mother’s abnormal antibodies enter the baby’s bloodstream. When the baby is born, there may be muscle weakness. The abnormal antibodies are often cleared from the baby in about two months. This will end the baby’s symptoms. Your doctor will ask about your symptoms and medical history. A physical exam will be done. You may need to see a neurologist. This type of doctor is an expert in diseases of the nervous system. Immunoglobulin given by IV might help reduce symptoms. The exact mechanism is unclear. This treatment seems to have fewer side effects that plasmapheresis. This is a procedure which cleans the blood of the abnormal antibodies. This process may need to be repeated at certain intervals. Removal of the thymus gland is recommended for most patients with MG. This surgery may improve the symptoms in some patients. This may only be needed if breathing is severely impaired. This can happen during an episode of myasthenic crisis. Therapy does not generally alter the course of the disease. It may be needed to help the patient cope with changes in muscle strength. It may also help with learning alternative ways to approach daily activities. If you have trouble swallowing, please notify your doctor immediately. You may wish to consult a dietitian to help you construct a healthy diet that is easier to swallow. If you have trouble speaking, you may wish to consult a speech therapist.